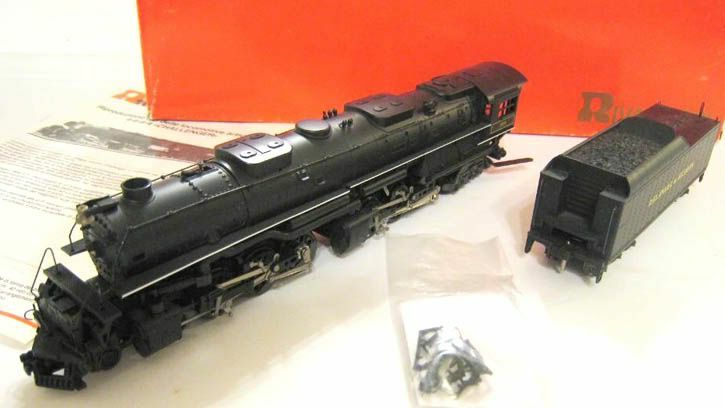 The 1981 AHM catalog refers to this version of the Challenger as a Union Pacific "Gray Hound" and the model receives a new five-digit stock number. AHM's 4-6-6-4 "Challenger" joins the product line in the spring of 1977. A 1980 listing shows this model at $349.98. This big steam engine like many in the AHM line was built in Italy by Rivarossi. A review of the model may be found in the June 1977 issue of Railroad Modeler magazine. The review is positive with the exception of the comment, "The only unhappy note about the Challenger is the realization that the day of the inexpensive locomotives, where it be brass or plastic, is over." The Challenger's original list price was $149.98 in 1977 at the time of this new product review. Following the AHM release, Rivarossi sold the Challenger under its own name. Above is the D&H example, which was Rivarossi's stock number 1599.